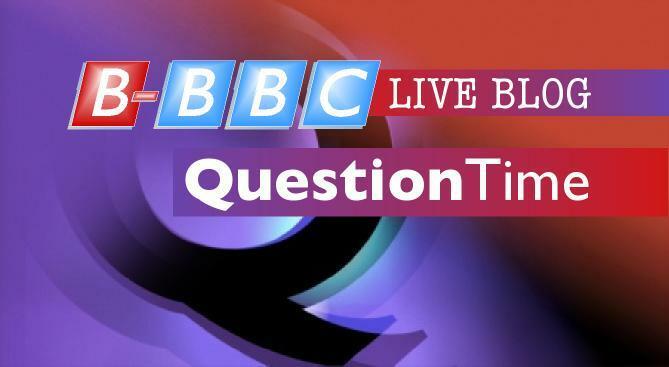 Question Time comes tonight from Glyndwr University’s William Aston Hall in Wrexham. It is represented at Westminster by Ian Lucas MP (Labour) and was the birthplace of Sir Foster Cunliffe, founder of the Royal Society of British Bowmen. Really. That’s about as interesting as it gets. Oh, and the local church steeple is known as one of the Seven Wonders of Wales. Don’t laugh. On the panel we have Former Home Secretary Alan Johnson, Labour MP for Hell West. He campaigned strongly for AV which was appropriate because he was also the second preference vote in his own marriage. On too we have journalist Julia Hartley-Brewer, former assistant editor and columnist at the Sunday Express and, stepping in for Health Secretary Andrew Lansley will be dripping wet Conservative MP Stephen Dorrell, former Health Secretary from 1995-1997. Also on the panel is journalist, author and serial quangocrat Simon Jenkins. The LiveBlog will also stay open for the surreal This Week, with Andrew Neil and Michael Portillo. The Blue Nun Bingo is looking squeaky at the top of the leaderboard to it’s all to play for this week. TheEye just assumed but Millie Tant spotted correctly. No TH this week. Alan Johnson was on the radio the other day…a five part series this week too…and the topic was “show me how you play Motorbiking/Remember you`re a Womble”-involving Chris Spedding. Who came up with this one then?…Prescott booked for the BBC panto rehearsals?…isn`t this blatent soft politicking by a bloke who`s achieved nothing in any area of life that we need to speak of? Will someone tell the linen suits upstairs that I too lived on a council estate…now can I have a series too? Who needs Postman Pot for a guide to posing with an electric guitar?…didn`t Mr Tony do that one to death…in the plural when it comes to Iraq/Afghanistan etc! Hope the cucumbers are German in the Green Room tonight! I’ll second you for your own show on the BBC. It would be a riot ! I thought This Week is off the schedule this week. Half-term hols or something. Nice one, I wasn’t paying attention. Thanks for that! Pity the 4th biggest party in the UK (UKIP) isn’t getting a look in. Farage got a brief bit of air time on the News Channel today to field challenges from the BBC newsreader about the immigration issue. As if he was supposed to be on the defensive and not immigration policy of the current and previous Governments. That’s enough for BBC balance to last several weeks. Yes, 4th biggest party with an enormous 3.1% share of the vote. Still, it prevented Dave from gaining a big majority, so its not all bad news is it? Yes, but the Green Party only got 1% of the vote. OK, they got one MP but, in contrast with UKIP, she is almost a permanent fixture on the BBC. So, what do we conclude ? The BBC is biased towards the Green Party and against UKIP and all with our money. Blatant and shameless, but that’s the BBC for you. Well what you see rather depends on which way you’re looking. In the last ten years Caroline Lucas has been on QT 12 times; Nigel Farage 17 times. Not exactly “blatant and shameless” is it? Sure, but consider the context, no? Which party has had more prominence longer? Which party resonates more with the general public outside of Brighton and Islington? I realize an actual MP should shift the balance in the Green’s favor, but how are these appearances spread out over the ten years? Where did they drag Dorrell up from and why ? I didn’t even know he was still an MP. Julia is a liberal, but by no means the worst of them-some conservative traits. As for the rest of them-I thought Brussels was the place where they got tagged and kept away-but presumably Ashdown did a Colditz and led the other paperweights back to their futures…if we don`t get Paddys “the day I nearly met Radko” in the next few days, then I`ll be surprised. Dorrell is what Major might have been without Spitting Images help!